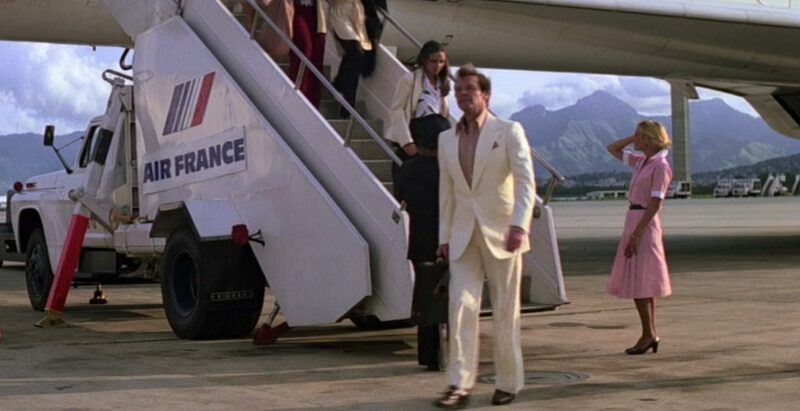 In Moonraker, Bond wears a cream suit appropriate for his arrival in sunny Rio de Janeiro. The composition of the cloth is likely silk or a silk and linen blend, which would be an appropriate cloth for Rio’s warm autumn weather when Carnival takes place. The suit is most likely made by Moore’s usual tailor at the time, Angelo Roma. The jacket is a button one with mother of pearl buttons. It is cut with padded straight shoulders, roped sleeve heads, a clean chest and a suppressed waist. There are long double vents, slanted pockets and three buttons on the cuffs—as opposed to four buttons on Moore’s other suits. The three buttons on the cuffs may have been done so there is an odd number of buttons on both the front and the cuffs. Likewise, the usual button two jackets that Angelo makes have an even four buttons on the cuffs. The suit trousers have a flat front and a wide leg with a slight flare. Moore wears a bespoke Frank Foster shirt in light brown, which appears to have a white hairline stripe, that complements Moore’s complexion very well. It has a long point collar, front placket and “Lapidus” tab cuffs. This is the only time in the series that Moore wears a suit without a tie, but the casual nature of the suit allows for this. The is also the only time Moore wears a puffed pocket handkerchief, perhaps to make up for the absence of a tie. It’s the same colour as the shirt, and it looks to be the same exact cloth, so the one time Moore wears something in his breast pocket he does it poorly by wearing an exact match. The only time a pocket handkerchief should match anything exactly is if both the shirt and handkerchief are white. Moore’s shoes are dark brown horse bit slip-ons, probably from Ferragamo. A supposed example of this suit was sold at Bonhams in Knightsbridge on 17 November 2005 for £9,600. The suit at auction was made by costumier Bermans and has two light brown buttons instead of one mother of pearl. It’s not the same suit with another button added, since the relationship to the waist button and pockets is different. But the Bermans suit at the auction is more or less a copy of the style of Moore’s usual tailor at the time, Angelo Roma, with strong shoulders and roped sleeve heads with a close cut through the body. I had asked someone in the business about things like this, and they said that they would leave the original maker’s label on the piece. Berman’s had good tailors of their own. I work in the film business too. Just seems odd to have a one-off made for a scene in Rio that looks just like all the others. Either way I like it – it is not as elegant as the light Hayward suits in the next 3 films but he looks damned cool getting off that plane in it. I’ve heard that it’s not uncommon for replicas of an original piece to be made for a film by a different maker. People often bring that up when talking about the North By Northwest suit being made by by Kilgour French & Stanbury and Quintino. So Angelo could possibly have made one or two examples of this suit. But the only tailored in the film that saw any amount of wear and tear was the grey silk suit in Venice and the double-breasted blazer, which I’m sure Angelo didn’t make any for the stuntman, and perhaps not Moore’s either. also I love the matching shirt/kerchief – rules be damned it looks spot on to my eye! 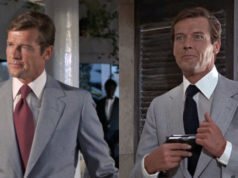 I suppose the argument could be made that white shirts happen to match a whole host of white cotton or linen pocket squares and those are perfectly acceptable. Matching the exact fabric of a tie to a pocket square often looks tacky, however, especially if it’s brightly coloured. I’m on the fence about this example. Nice, cool look overall and I have to admit that I also don’t see anything in the shirt and handkerchief combination which jars with me. What is interesting is that this was the only occasion Moore wore this type of outfit during his entire Bond tenure. A handkerchief would have worked well with the blazer and open neck shirt ensemble in FYEO, for example and I could certainly see Brosnan sporting a similar (if differently styled for the times) ensemble in similar circumstances. Finally, would the change of buttons on the suit finally sold in Bonhams have any bearing in the debate around the provenance of the suit/s produced? My untrained eye doesn’t see a lot of difference in the overall style of this and Angelo’s others from this movie or its predecessor. Thank you for writing about one of my fav. James Bond Films. 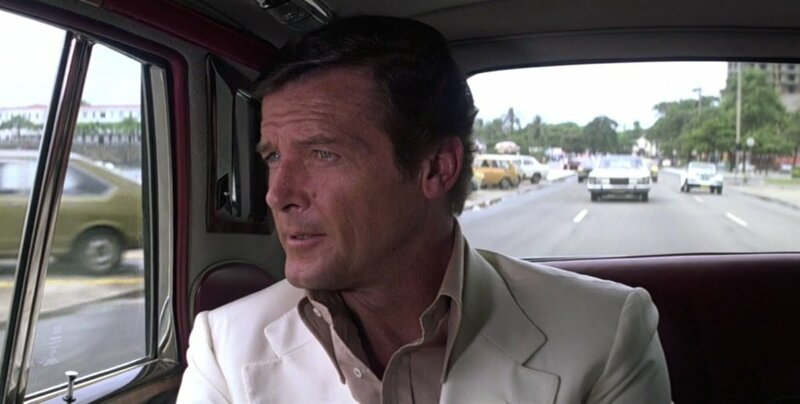 I always love the Scene when James Bond arrive in Rio. Last Saturday I saw MR and hoped/wish you would write about the white Suit! Furthermore, the benchmark for what is deemed “well dressed” has changed too over the years so – as we have witnessed first hand on this blog – clothes once deemed elegant are now fair game for sneers, in this era when casual is king. Despite this, for me anyway, real elegance transcends time. This reminds me of the scene when Bond arrives in the Bahamas in the Grey linen suit from casino royale. Amazing look! he looks kickass, this essemble remind me somehow of the scarface outfits, of course without the hollywood gangsterish look, i know is not the subject, but i would like to hear your opinion on the scarface outfits matt. I love reading your posts, and I’ve learnt so much about suits and Bond from reading them! I don’t want to sound rude, especially not on my first comment, but are you sure this is the only time he doesn’t wear a tie with his suit? I could swear that later in MR on top of the cable car and in the doctor’s van he doesn’t wear a tie with his dark suit. That’s a dinner suit, not a regular suit. And he did wear a bow tie with it, he just removed it by the next morning. Since he didn’t change his clothes it implies he didn’t make it back to his hotel room that night. Ooooh, I see! Sorry, I didn’t realise! As you can see I’m still learning hahaha! Well, this is not the usual look I like (no surprise to the regulars here), but I have always dug this scene. It is ridiculously over-the-top, the epitome of the 1977-1979 Bond films with, as Steven Jay Rubin put it, Bond, as celebrity spy, unabashedly enjoying the good life. Roger and his suit look great here, if most un-Bond like. Top marks. Considering the situation the world was in in the late 1970’s (terrorism, stagflation, etc. ), watching “Bond, as celebrity spy, unabashedly enjoying the good life” was just what the doctor ordered! If only Bond’s producers would realize that that’s what’s needed now as well! Seriously though, the fit of this suit is perfect, and because it fits him so well through the body it prevents some of the more dated elements from making him appear to be a late 70’s caricature. The jacket is actually not too dissimilar from the current Tom Ford line. What is that rule, that you can only match a white pocket handkerchief with a shirt? I have heard that some tailors, when tailoring shirts can cut out a small piece of the same cloth so you would have an exact match for the pocket. Is that a fashion faux-pas? I have never heard that..? Anyway I like it on Sir Roger in this scene! The Concorde arriving with the theme music is (without very big competition) the best scene in the film. It’s a faux pas to perfectly match such things. Just like a pocket handkerchief should not be of the same cloth as tie, the same should go for the shirt. White doesn’t apply. Did you mean to say “should NOT be…”? Thanks. Yes I did! Fixed now. Matt , when did the suit-without-tie look start getting acceptable ? We know That in the1980s , Timothy Dalton wore at least 3 suits without ties during his time as 007. 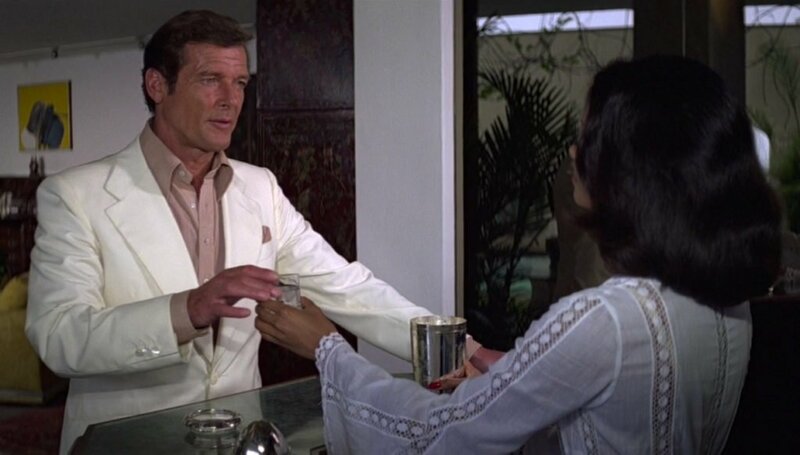 Moonraker takes place in 1979 when Roger Moore is wearing this cream silk suit without a tie. But at the same time , we know that in the 1960s , Sean Connery and Cary Grant never wore a suit without a tie. So when did the look originate ? Going back to the 1930s, people were wearing sporty warm-weather suits, such as this, at resorts without ties. Cravats and neckerchiefs were often worn instead of ties. This look as seen in Moonraker didn’t take a strong hold until the 1970s. 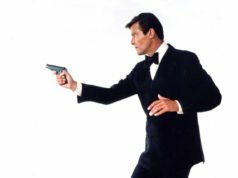 The business suit without a tie, as seen in Licence to Kill, wasn’t considered a complete look until the 2000s, but it’s still not a look for James Bond. If James Bond is wearing a business suit without a tie, it’s because he discarded his tie for a reason. The only example of this is in Quantum of Solace, where he starts with a tie but discards it later on when he should be wearing something but is stuck in his suit from the evening before.